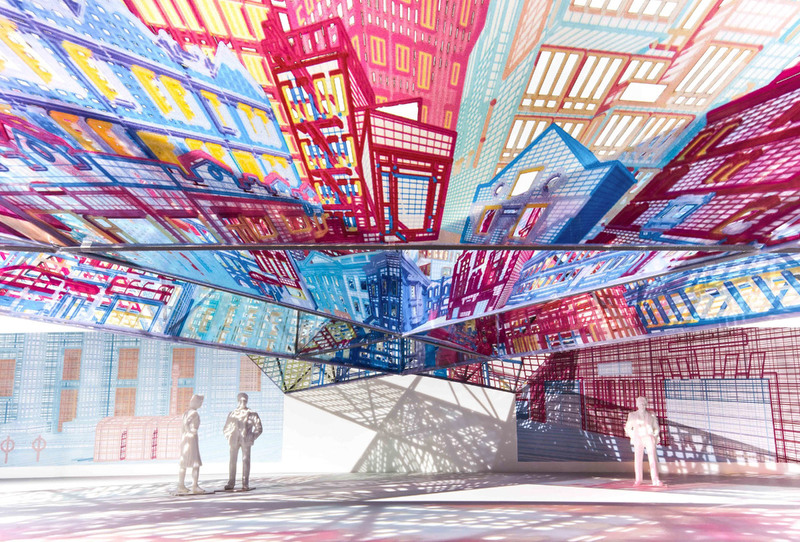 From now until September 3, the MoMA will be exhibiting Dream The Combine’s winning scheme for this year’s Young Architects Program (YAP), as well as the other four finalists’ work. 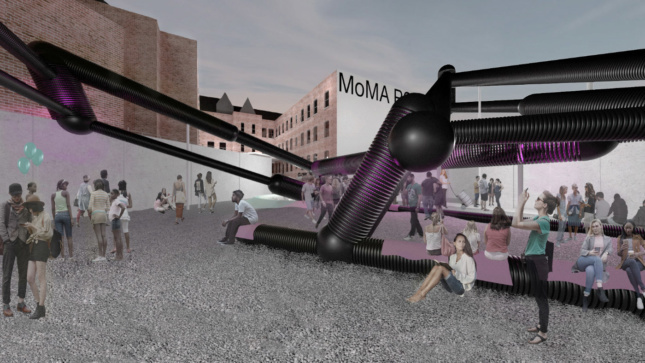 Hide & Seek opens to the public at MoMA PS1 on June 28, but until then, the MoMA exhibition provides a sneak peek that should tide over visitors. Dream The Combine is the 19th YAP winner. 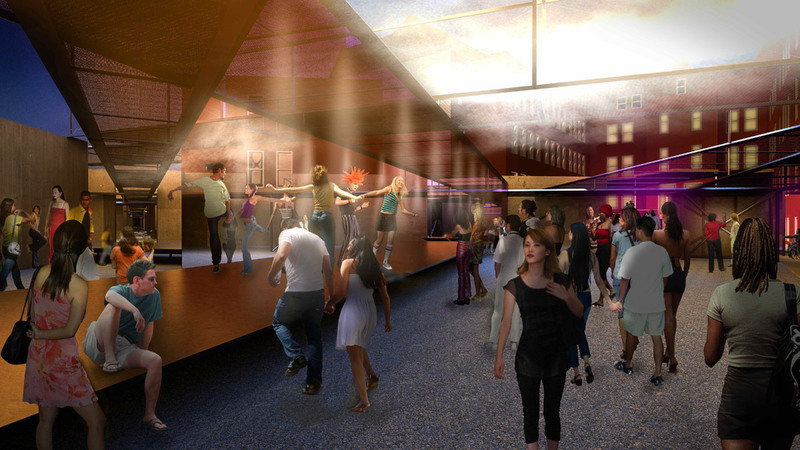 The firm’s scheme will create a series of dynamic pavilions across PS1’s courtyard and up the steps to the museum. Nine overlapping black steel catwalks will stretch across the open area, including inaccessible platforms hovering overhead. Three of the paths will hold giant, moveable mirrors that can “turn an individual into a crowd” or unify separate elements of the installation. Fabric sails will be floated overhead at certain points and fitted with misters to create an ethereal and spacey feeling at night. 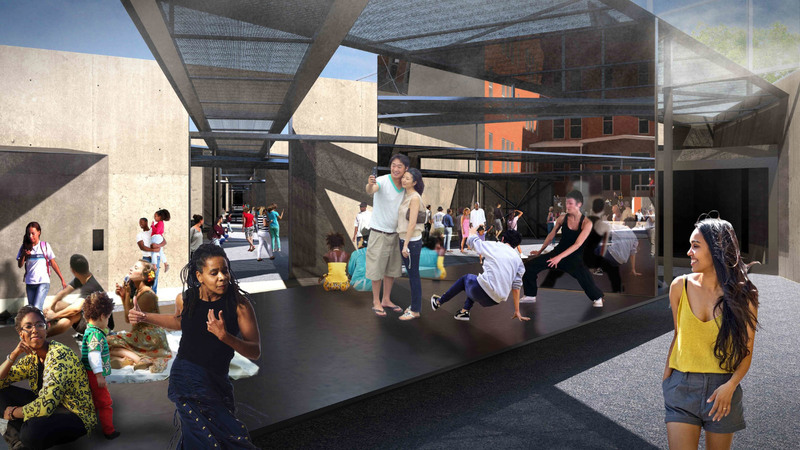 Hide & Seek is, according to Jennifer Newsom, an attempt to create an ever-changing experience in PS1’s courtyard by building new visual connections throughout the space and beyond. What exactly is “logistics”? How can we better connect and explore the invisible machinery that drives modern global commerce? For Shelf Life, LECAVALIER R+D re-appropriates the stacking and racking machinery usually found in factories and turns it into an immersive exhibition structure. 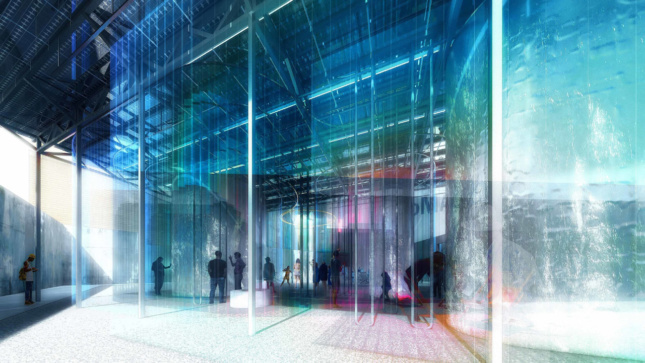 In their proposal, furniture is built straight into the massive frame, and the entire pavilion would be disassembled and integrated back into the global logistics stream at the end of summer. Out of the Picture sought, much like Hide and Seek, to “bring the outside in” to PS1’s courtyard. Enormous fabric banners are stretched across the central plaza and decorated with distorted images of the surrounding buildings. The result is a reinterpretation of the neighborhood from a new perspective, transformed but still readable. Lines and vectors are often abstract concepts on a screen in architecture, but BairBalliet sought to translate the often-striking lines in diagrams into tangible structures. During the day, Loud Lines is solid black and imposing, but at night, the structure pulses with neon light from within. 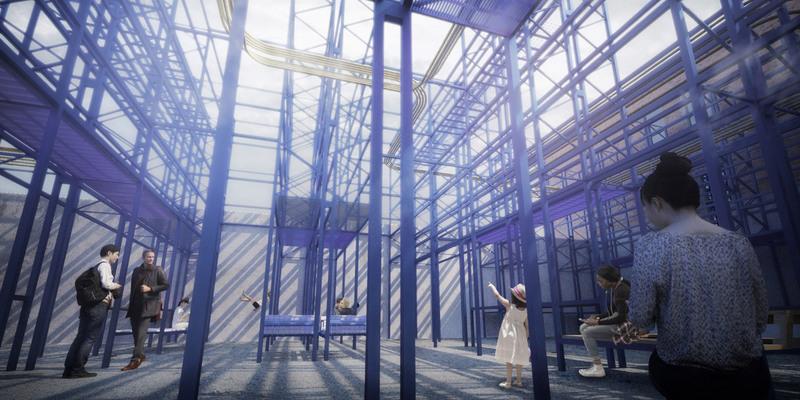 The rods emit a cooling mist to further blur the lines between the real and the immaterial. The Beastie proposed a technologically forward-thinking assemblage in PS1’s courtyard; an interactive structure that would have turned solar energy into ice. Inside the multi-walled chambers of The Beastie, visitors would explore a range of different temperatures, ranging from pleasant to freezing. More than a cool-down station, The Beastie was intended to raise awareness of climate change by exposing guests to “climatic confusion”. All of the YAP finalists were required to design an outdoor shelter that included shade, water, and seating. After the proposals are finished showing at the MoMA, the installation will travel to MAXXI (Museo nazionale delle arti del XXI secolo) in Rome, and CONSTRUCTO in Santiago.